The chance of losing an animal are always resting in the back of your mind before you pull the trigger especially when the range is starting to stretch out a bit. A lot of things come into play on those long shots like your shooting ability, the caliber you use ( is it enough) the load and projectile you use to name a few. This weekend was one of those that tested Beeman's shooting skills. Once again Beeman choose to sit and watch from the "lookout" as he was convinced there were still more animals coming out on the clear fell. I was dropped off at another location for the evening hunt but despite plenty of sign no animals showed up. Beeman and partner Mrs Beeman arrived about 4.00pm and climbed to the "lookout" and settled in for the evening, both scanning the long bush edge for any sign of animals. About an hour before dark just as the sun dipped behind the trees Beeman spotted movement, a stag with long velvet, no time to waste so a good rest was taken and as the stag feed close to a patch of gorse on the bush edge, the shot was taken. The distinctive thump of a hit came back over the 528yards but the stag spun round and dived back into the big pines. Now the questions were racing through Beeman's mind where had I hit him, was the caliber (260 Rem) and projectile (143 gr ELD X) up to the task. 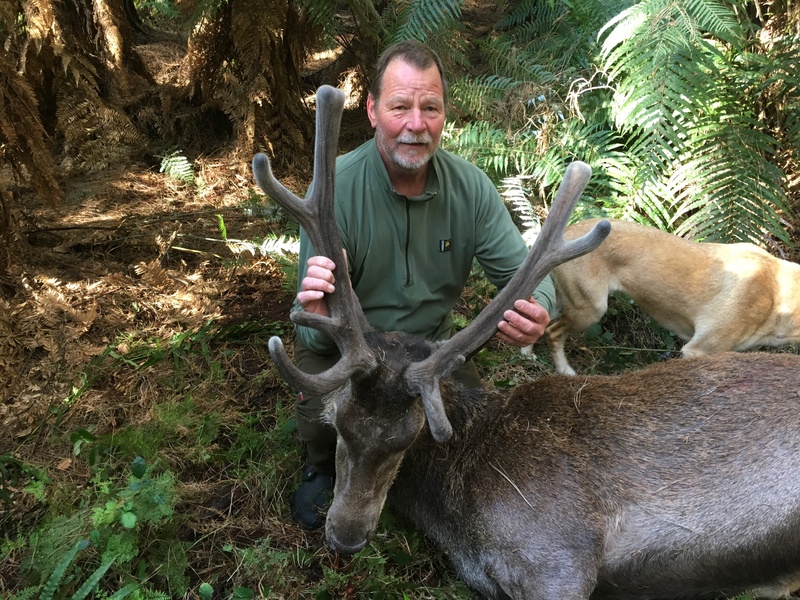 About now I got a call on the radio, Just got another stag, was the call, but it's made it back into the bush so Mrs Beeman was coming to get you so I could lend a hand searching and recovering the animal, hopefully before dark. Shortly after I was picked up and taken back to the search area. I grabbed my torch as darkness was coming fast and made my way up onto the ridge where the stag was when the shot was taken. When I got there Beeman was way down the gully with the torch going as the bush was already dark. Beeman hadn't found any blood but had followed fresh skid marks down to where he was searching. I started to scour the face on the other side of the gully then we meet up and searched any likely looking spots but again no blood or signs of a animal were found. Reluctantly we admitted defeat for now, Beeman and his son would bring the dog in the morning and have another look in better light. The following day the search continued and after a short time Rebar the dog came slinking back from a spot a bit lower down from where I was looking last night so Neil decided to check it out and sure enough the stag was laying there dead. On inspection they found the reason there was no blood...the bullet had hit the middle of the gut, and angled forward through the chest cavity where it took out one lung and then travelled forward to lodge in the front of the chest. One rib had been clipped, no shoulder had been hit so it was basically only soft tissue that was encountered. The gully the stag was in lead to an old skid site and road that was overgrown but eventually came out onto a road that they could drive to. Mrs Beeman carried the velvet head back to the truck and drove around to the pick up point while Beeman and son dragged the 104 kg animal about 1 km. Once they got to the pick up area they had to cut the stag in half and drag the pieces up and out across another clear cut to reach the truck. After loading the pieces onto the truck they noticed a lump under the skin as the hair had come off while being dragged... it was the projectile. Back home the perfectly mushroomed projectile was weighted and came out at 105grains. I checked the ballistic chart for Beeman's load and found the 143 gr ELD X was still travelling at 2080 fps at 528 yards and had 1374 ftp energy left. The shot had hit a bit far back due to the angle but the penetration had been excellent. The stag ran downhill about 200 yards before tipping over. 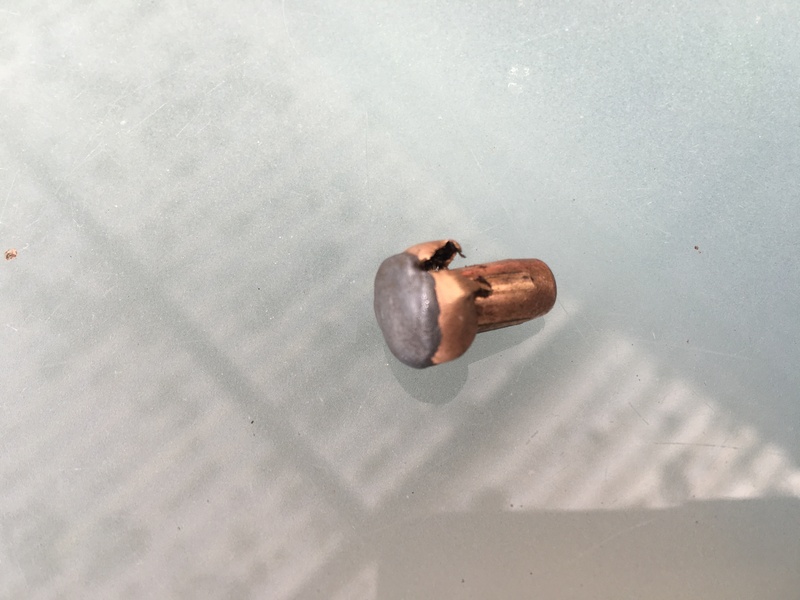 The bullet had mushroomed perfectly and retained all the lead core. Excellent overall performance. There are reasons why some people like the bullet exit and others like them to stay inside, I prefer bullets to exit, as in this case we would have found a blood trail that night and we would have got the animal out there and then. It was a lucky find, in the end and perseverance paid off so if you think you have pulled off a good shot then follow it up, better than losing an animal. hillclima, Shootm, Tahr and 28 others like this. ... Good account, nicely written @Mooseman. You are fortunate that we didn't find it in the dark as it took 2 hours to get it out to the ute. Thanks . Boaraxa, Steve123, Sideshow and 1 others like this. Yeh I know what you are saying but it would have saved you a lot of worry over night if we had have got him after you shot him. Boaraxa, BeeMan and dannyb like this. I was given the VERY important job of bringing the velvet down the hill without marking it . I hadn't come prepared for walking with just gumboots on so had to be very careful with my footing. As you can see in the photo it was rather large and I'm not the biggest person around. It would have made a good video watching me tip toeing through the slash with both hands on the head at all times, trying not to touch any bits of wood for fear of letting the side down while the guys were busting their guts trying to haul the stag out. Once back at the truck I wasn't sure how I was going to fit it in the seat so I wrapped the bloody head in a raincoat and sat it safely on the passenger seat where I could hold it with one hand while driving slowly with the other. One thing I witnessed today was the perseverance and determination shown by 2 amazing men - I'm so proud to have @BeeMan and his son as my hunting teachers. Oh, and @Mooseman too. veitnamcam, Cyclops, Boaraxa and 4 others like this. Big animal! Quite a bit of velvet too. It was a cold night and laying on cold ground and in the shade so it did cool to some degree. Back legs and back steaks are all good. Anything close to the guts will end up dog tucker. It is best to get them out straight away when possible. BeeMan and Cordite like this. great work on perservering...thats good bullet preformance but as you said its nice if they fall out the other side and let the red stuff out. Mooseman and BeeMan like this. Yeh it had a lot of velvet for the time of year must have dropped in July some time. 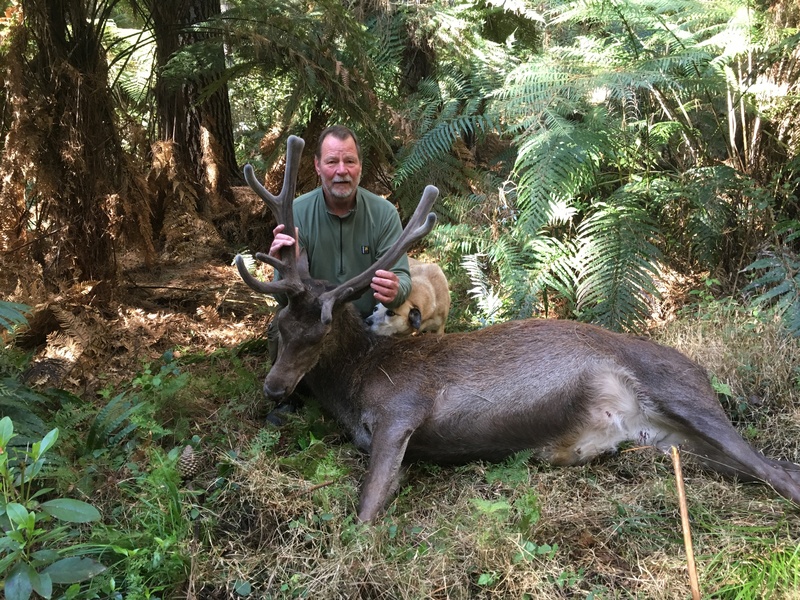 Those ELD x are working well at the moment especially on our sized game if you look at post "A couple from Canada " the Bull Elk was shot with a 162 gr ELD X out of a 7mm Mag and the bullet sorta went to pieces with bits of jacket being found in the off shoulder. Thats a good read, well done all concerned. Whats the go with the velvet, worth more if undamaged ?